The Iris is from Lisa Gowing's Ballet Beautiful Collection. It features hand appliqued Ivory corded lace with a scallop trim over ivory liquid satin. It is slimline, has a V neckline bodice with a low V back, capped lace sleeves, a satin waistband, scalloped hem and train. 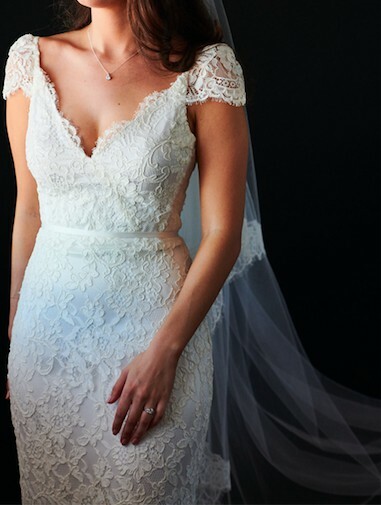 I wore this dress at my wedding in November 2017 and absolutely adored it (and so did my husband and guests)! The fit was amazing (I am usually a size 9), it was very elegant, the train was the perfect length, and importantly it was easy to dance in! I live in Randwick and am happy for you to come and try the dress on. Contact me for any further questions or photos! Once you send a message, Talia can invite you to purchase the dress.